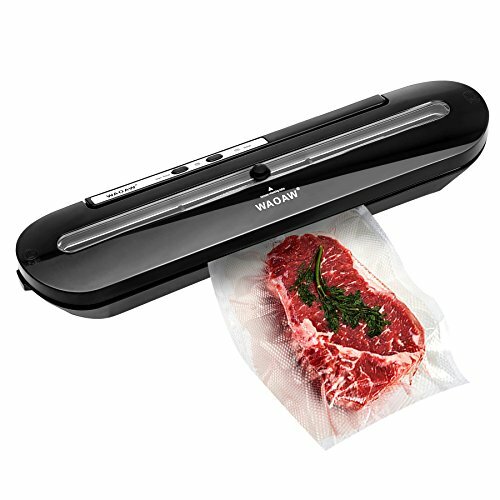 Food vacuum sealer removes air from specially designed bags. Multi-layer material heat seals to keep air out and prevent freezer burn, reduces spoilage and food waste. And cooking and meal preparation will become easier, more economical and faster. Keep food fresh in the freezer up to 5x longer and in the fridge or pantry up to 2x longer, compared to ordinary storage methods. Fits up to 11.4'' width WAOAW or other brand vacuum sealer bags and rolls. Compact size and lightweight design for easy storage and move around. Two Sealing Modes: Use "Vac Seal" button, vacuum seal your different types of food or other household items. And use "Seal" function to reseal bags of rolls, snacks and others that you only want to seal. Accessory hose can vacuum seal canisters or wine stoppers. Starter Kit includes: 1 x Accessory Hose; 1x Wine Stopper; 5 x Heat Seal Bags(4.7''x 7.9''); 5 x Heat Seal Bags(7.9'' x 9.9''); 1 x User Manual. If you have any questions about this product by WAOAW, contact us by completing and submitting the form below. If you are looking for a specif part number, please include it with your message.